當舍 武彦, 他（-）「生体内の一酸化窒素動態：NOの産生、授受、消去システムの構造機能解析」, <http://www.riken.jp/lab-www/spectroscopy/MolecularSystem/pdf/seitai_25.pdf> 2018年9月20日アクセス. Roméro-Graillet C, et al（1997）「Nitric oxide produced by ultraviolet-irradiated keratinocytes stimulates melanogenesis.」The Journal of Clinical Investigation(99)(4),635–642. 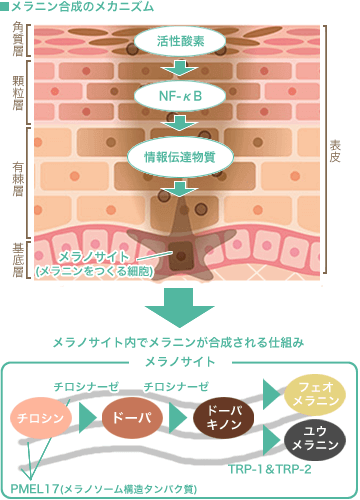 Weller R, et al（1997）「Nitric oxide–a newly discovered chemical transmitter in human skin.」British Journal of Dermatology(137)(5),665-672.